For decades, Gotham city was under the vigilant protection of the dynamic duo known as Batman & Robin. Following the death of Jason Todd, the second Robin, Bruce Wayne went into retirement. Flash forward Ten years later, and Gotham is on the edge of oblivion. A violent youth gang known as the mutants has the city in the grip of panic. Things are steadily growing worse, as law enforcement seems powerless in the face of this rapidly emerging threat. Meanwhile, Bruce Wayne grows antsy. Heeding the relentless call of his darker half, he dons the cape and cowl once more. Alas, many Gothamites don’t see his return as cause for celebration. Never the less, Batman continues his crusade undeterred. Next to Alan Moore’s Watchmen, Batman: The Dark Knight Returns is easily the most influential superhero story of the past 30 years. That pedigree makes it rather intimidating for anyone looking to launch an adaptation of any sort. Luckily, the creative forces behind the DC Universe Animated Original Movies line are up for just such a challenge. 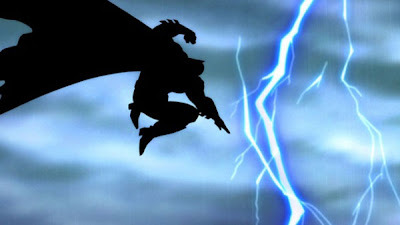 Batman The Dark Knight Returns Part 1 is the first half of a two-part animated feature that aims to bring Frank Miller’s groundbreaking four-issue limited series successfully to life. Of course, there isn’t any room for failure, as the text is considered hallowed ground. Bearing that in mind, the filmmakers tread carefully but confidently. Aside from its fascist politics, the most striking thing about Batman: The Dark Knight Returns was the artwork. By 1986, Frank Miller was at the top of his game. His rough-edged visual style began to reflect the hard boiled sensibilities of his storytelling. His pencils felt somewhat unrefined, but they were abrasive and kinetic. For the most part, Batman: The Dark Knight Returns Volume 1 retains those qualities. Iconic panels and pages from the graphic novel form the foundation of the film’s production/ character design. The film’s staunch fidelity to the source material is evidenced by its depiction of Batman himself. Miller envisioned a middle aged version of the character that was a grizzled war hero. The film stays true to that vision. Like Miller’s drawings, Batman is suitably Cro-Magnon, while somehow retaining a dignified quality. His shoulders are broad, and his posture often hunched over. His chin looks like a horizontally laid doggy bone, and his physique is so bulky that it’s a bit hard to imagine him scaling buildings and rooftops. He’s the forgotten relic of a bygone age, just like Miller intended him to be. Batman: The Dark Knight Returns carried many cultural hallmarks of the Reagan-Bush years. The animated version also bears many of those same characteristics. For example, one scene shows the mutants dancing to electro/ Latin freestyle music emanating from a boom box. In keeping with this theme, composer Christopher Drake crafts a musical score which harkens back to the synthetic sounds of the 1980’s. It recalls the work of Vince DiCola, Tangerine Dream, and Brad Fiedel. This makes for a perfect marriage with the visuals, which often fetishize machinery and technology. Military weaponry is also fetishized, as certain thugs are shown carrying M60 machine guns. While I imagine such heavy artillery would be very impractical for street crime, it’s in perfect keeping with both the text and the sensibilities of 80’s action flicks. Much has been made of the similarities between Batman: The Dark Knight Returns and Robocop. The former predates the latter, and is believed to be an unacknowledged influence. This is mostly due to Robocop’s extensive use of “media breaks,” or faux television news segments. The animated version has retained that device, handily using it as a form of Greek chorus. Initially, it has the disorienting feeling of channel surfing. Characterizations in animated films often rest on the quality of voice acting. With all due respect to Kevin Conroy, Peter Weller simply owns this iteration of Batman. Given his status as the man inside the Robocop suit, some may find his casting a bit too on the nose. Still, his performance never devolves into self-parody. As with the adaptation of Batman: Year One, there is no voice over narration to reveal Batman’s thoughts. While, that is a deviation from the graphic novel, the filmmakers do a good job of conveying such things visually. All the major events from the graphic novel have been turned into set pieces worthy of a blockbuster. Batman’s rooftop takedown of Harvey Dent’s crew puts similar such sequences in Nolan’s Dark Knight Trilogy to shame. The animator’s also manage to supplement all the right moments. Batman’s junkyard faceoff with the mutant leader feels much longer and more brutal than it did on the page. The fight choreography is incredibly vivid and precise. Also notable is Batman’s aforementioned first night back in the saddle, which plays simultaneously like Robocop’s first night out on patrol and Superman’s first night out as a superhero. Batman: The Dark Knight Returns Part 1 is every bit what fans have come to expect from DC Universe Animated Original Movies line. It’s big and reverent, yet it exhibits a casual swagger. It doesn’t agonize over the course it sets for itself. It simply makes its way up the mountain. As renowned as this text is, adapting it needn’t be an arduous chore. For all of its darkness and fascist overtones, the graphic novel was one Hell of an exciting read. That is what so many subsequent Batman stories have forgotten, and what this animated feature seems to remember quite well. This was a carefully planned endeavor. One can only hope that as much care went into the second half, which I frankly cannot wait to see.